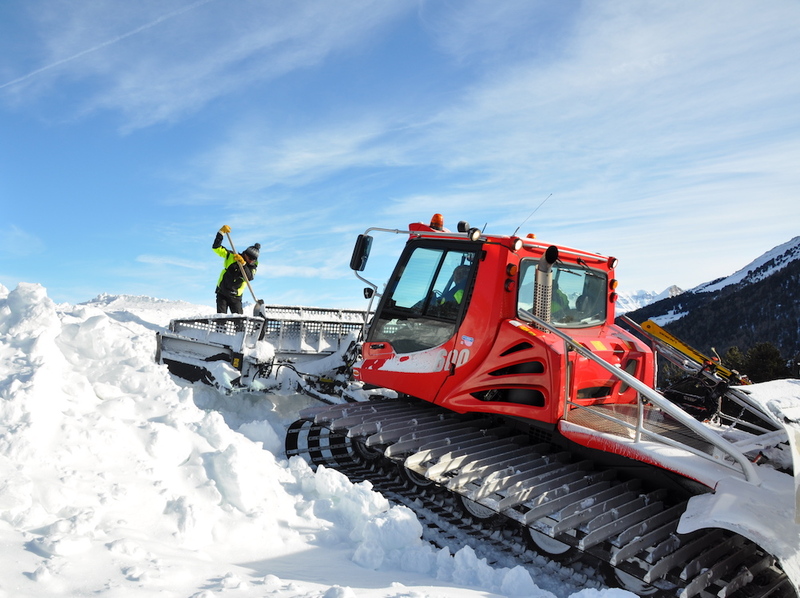 A piste grooming machine is pushing snow over the mouth of a hole, burying a man deeply inside. It’s a cold day — around -11c in the sunshine — but the mountain rescue teams around me assure me that under the snow, he will be warmer than we are standing in the air. 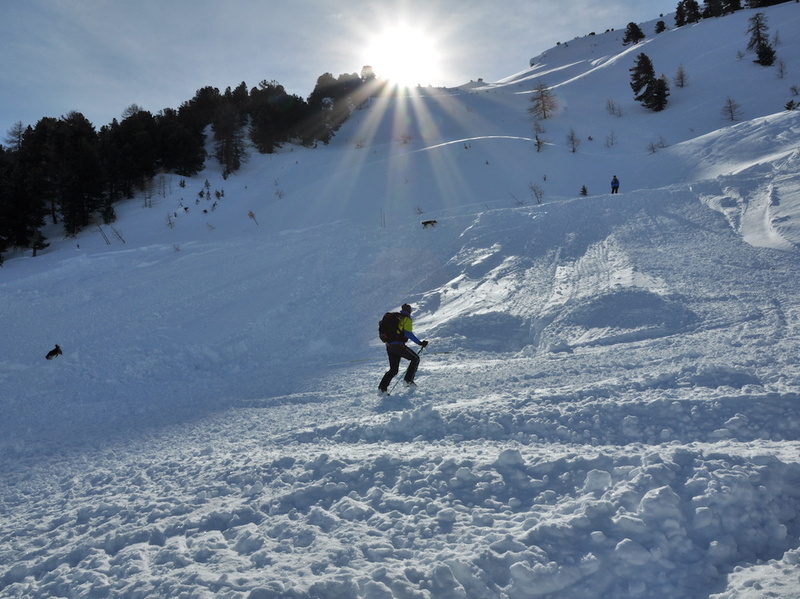 A piste basher buries the “avalanche victim”: I declined to volunteer! Six other people are being buried in a similar manner — a scattering of others standing around with shovels, observing the goings-on. Further down the valley I can hear excited barks of huge, furry German Shepherd dogs and the smaller, yappier barks of Border Collies, all eager to be allowed to get on with their job. We’re standing on the side of a mountain in La Norma, a small, north-facing ski resort in the Haute Maurienne Vanoise, a valley sandwiched between the Tarentaise and the Italian border. 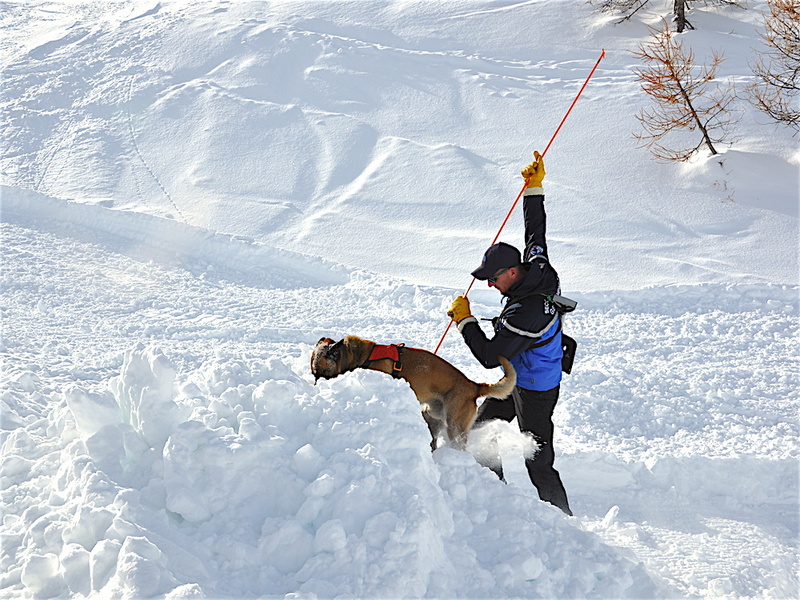 I’ve been invited to watch 20 or so avalanche dogs from the Maurienne and surrounding area on exercise. They are mainly collies and German shepherds, but there is one Red Setter and a black lab; all are fully trained except two, who are doing a separate “nursery” exercise. We convened in the Grizzli restaurant, halfway up the mountain in La Norma. 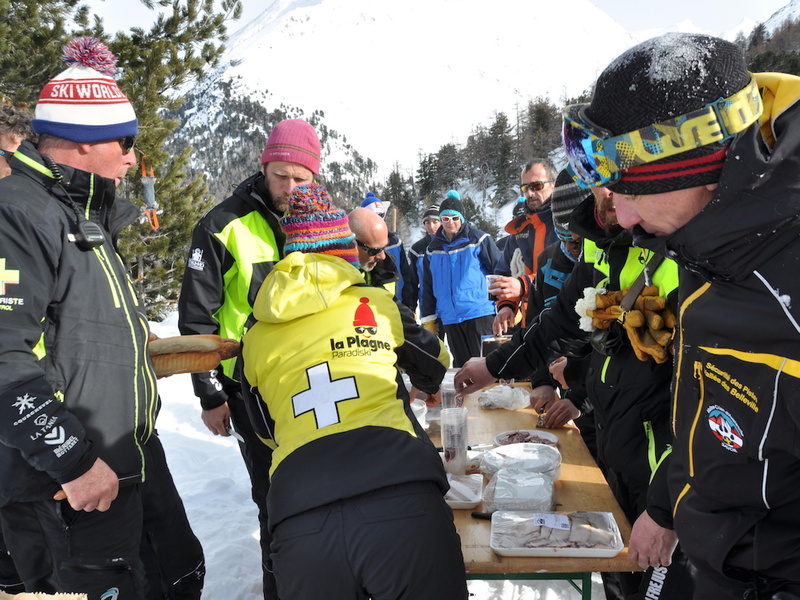 As well as mountain rescue teams and avalanche dog handlers from La Norma, Aussois, Valfrejus, Bonneval-sur-Arc and Val Cenis, the resorts that together make up the Haute Maurienne Valley — there are teams from Bardonecchia, just 20 minutes away over the Italian border, from Val d’Isere, Orelle, Les Menuires and La Plagne, plus gendarmerie. The first pair of dogs and their handlers are making their way up the valley in the sunshine — the dogs are being told to “cherche” (look for/ search). They criss-cross the area, handlers walking quietly behind them with a probe. Given the “victims” are buried so deep, and there’s so much scent around from people walking over the area, I wonder how they will find those buried. Or how long it will take. A matter of minutes is the answer: the first dog, Taos, picks up the scent of a buried man and starts to bark and dig frantically at the snow. His owner/handler Favian Fayolle runs over, with other team members on hand with shovels and they all begin to dig, Favian encouraging Taos all the time. 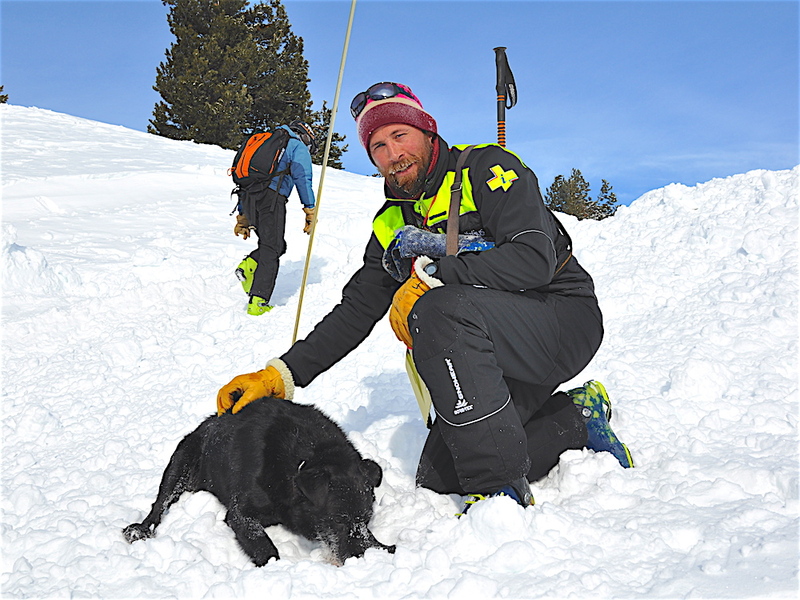 As the digging finds gold: an opening in the snow, the teams stand back and allow Taos to slither in, and 20 seconds later remerge pulling the victim with the training dummy (much like those used to train gundogs) he was holding: because this, to the dogs, is just a game. There’s a brief play — “victims” were asked not to make too much of a fuss of the dog, a quick play then over — and the dog’s duty (for now) is done. 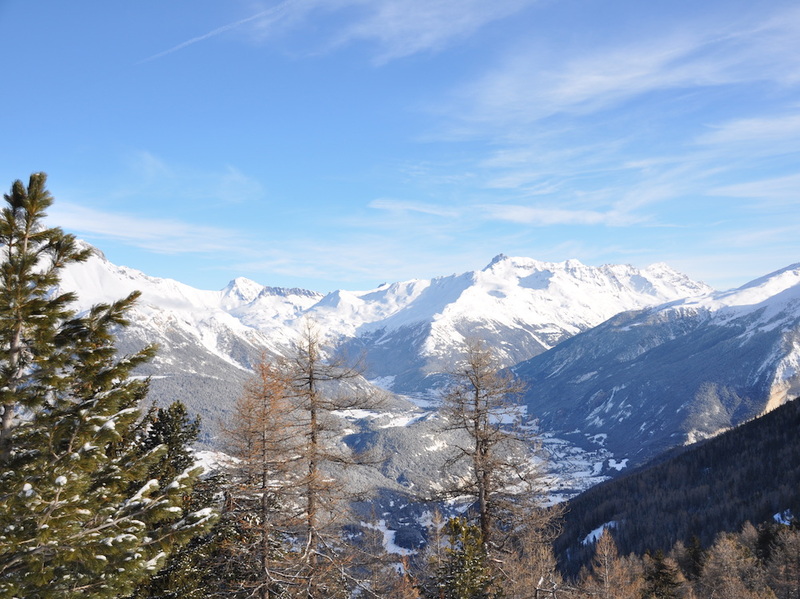 This is for the sake of the skiers who use these mountains — and those all around the Maurienne and Tarentaise Valleys. 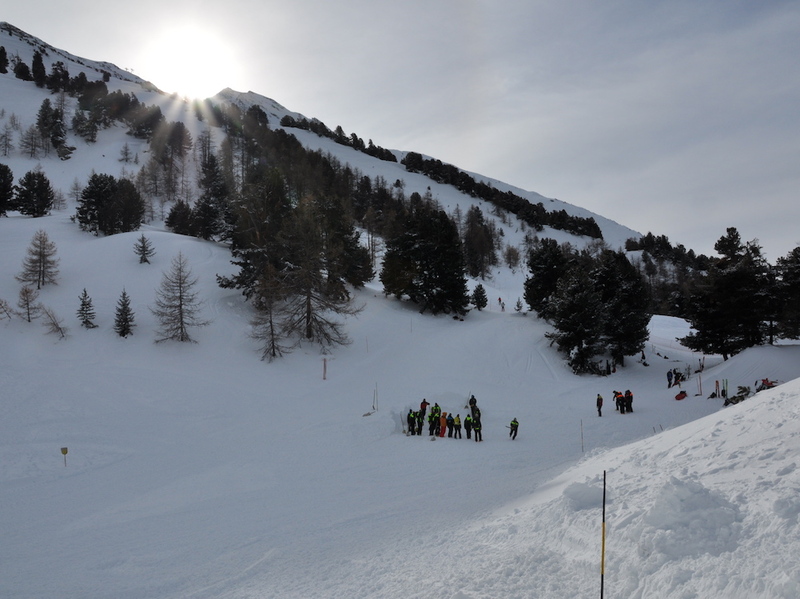 With the extreme weather this year, one death was reported of a farmer in Bonneval-sur-Arc, buried by a spontaneous avalanche, but last year four skiers died in Valfrejus. “They were four Dutch men, in their early twenties,” a mountain rescue man from Valfrejus tells me. He raises an eyebrow when I ask him if they were skiing with or without a guide, and shakes his head. It’s a common pattern — young people skiing off-piste with little awareness of the dangers nor the terrain. The teams are gracious, and don’t point fingers, but when I probe a little more they hint at the Brits and Dutch being among the worst culprits. I shudder at the time, watching these dogs work: it’s not just our lives we endanger when taking risks in the mountains. But of course not all avalanches are set off by foolhardy skiers. Back to the dogs, and Taos is ruling the roost — he’s found two victims and doesn’t appear to want to stop. 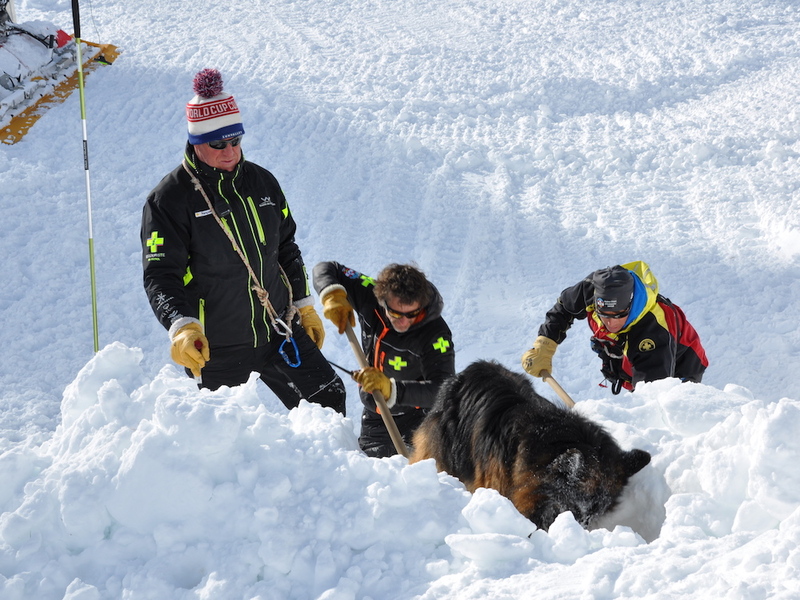 Between sets of dogs, the piste basher is busy again, burying more willing volunteers. I’m not one of them: I’ve been buried in a small snow-hole once before while watching an avalanche dog work and I wouldn’t want a piste groomer to be shovelling snow on top of me. It takes several hours for all the dogs to complete their searches — none of them are timed, this is just an exercise for them. And when it’s over, it’s the go of the younger dogs, early on in their training. 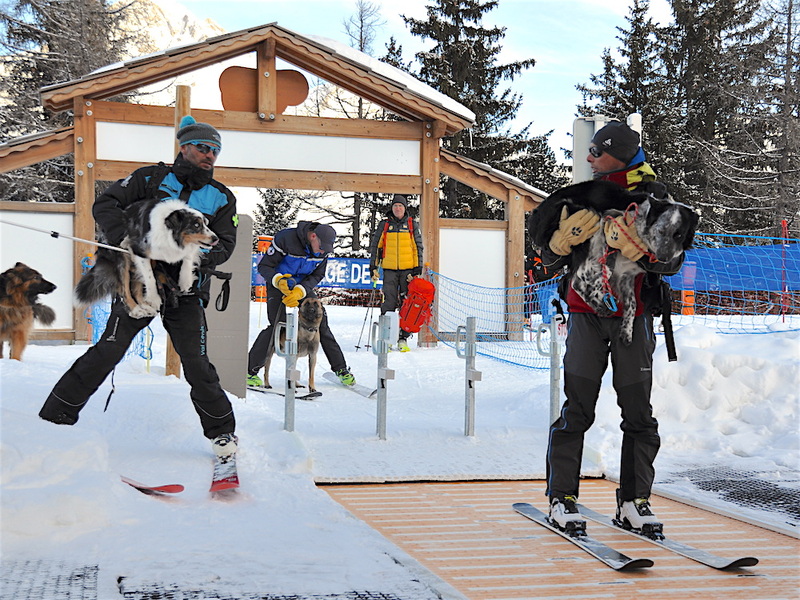 They play with the training dummy and then while Nox, an eight-month-old border collie sits with his handler from Val d’Isère, the “victim” runs and jumps into a snowhole, Nox chases and gets his prize. Back they go again, only this time the victim is partially buried and Nox has to dig him out a little. A third time, there is more digging, and a huge game and praise at the end. The trick is for this pup is to make the exercise fun. It’s not a job. Watching these animals work is humbling. Earlier in the day, they’d each hopped onto the Arlette chairlift beside the Grizzli, owners taking them one by one, either holding them in their arms, heaving them up or having the dog jump, or hop onto the chair beside them. After the exercise, the dogs either run beside their owners or hop up onto their shoulders and ride all the way down to the base. 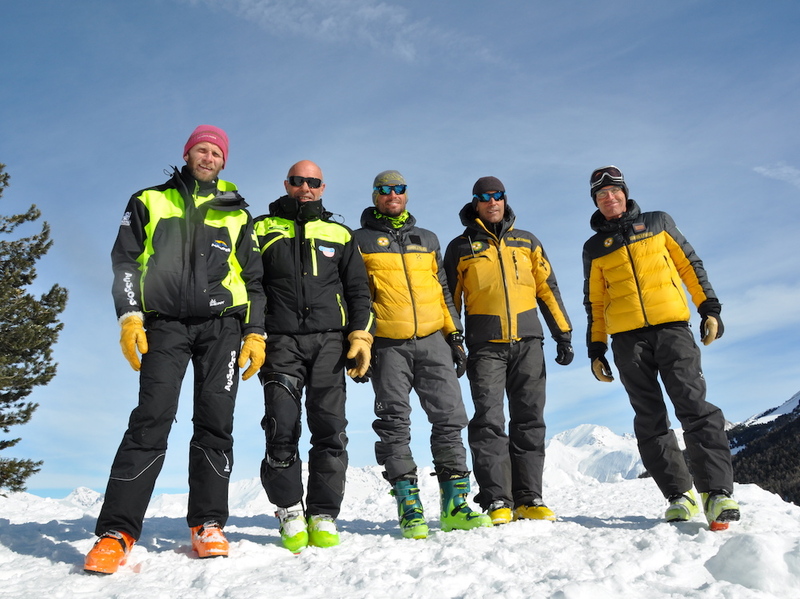 The trust they have in their handlers is extraordinary; and they’re doing all of this, their lives dedicated entirely to, the welfare of us skiers.